About the Book: Aoife Finley is bursting at the seams with creativity. No one daydreams better than her and her imagination knows no bounds. 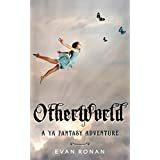 OtherWorld is a YA fantasy adventure about the power of the imagination and how anything is possible. It is 80,000 words long and Evan Ronan’s first (but hopefully not last) YA novel. "This is an awesome series of books." "So many twists and turns." "I just couldn't put it down." "Two days to read all five books." "Deserves more than five stars." "Great pacing, sympathetic characters, and a twisty plot." Evan also loves historical fiction and with fellow author Nathanael Green writes The Tomahawk and Saber series. Set in the Pennsylvania Colony in the days of the French and Indian War, these books are good old-fashioned, character-driven adventure stories where cultures clash and life is nasty, brutish, and often short. The first in the series is called Language of the Bear. Evan has worked as a drycleaner, waiter, salesman, magazine editor, painter, consultant, and attorney. But his favorite job is being a dad. One of these days he'll tend bar, so he can be like every other writer ever. He and his family live in New Jersey (Exit 4, before you ask), in the same town Eddie McCloskey grew up in. You can contact Evan at ronaniswriting@gmail.com or on his website, ronaniswriting.blogspot.com. My Review: In this time when all authors are only thinking about writing endless series, it is very nice to read a book that has a beginning, a middle and an end. The author did an amazing job creating a set of characters that were very well built and in special our heroine, Aoife. She is an amazing girl, with an incredible imagination. All her friends (Al, lady in green, etc..) are trying to help her to save her imaginary world to collapse in its interaction with the real world. Joining this group are some of her classmates from school. The plot is very well constructed and the story develops in a nice pace. At the end we stay cheering for Aoife and her group to achieve their goal, through loyalty and friendship. More than a young adult novel, this book will satisfy readers from all ages. I received an electronic copy of the book from the author, but I was not requested to provide a positive review. Opinion expressed here is my own.